Pikes Peak Suicide Prevention has an amazing mission: To unite the community in addressing suicide in the Pikes Peak Region through education, intervention, and postvention. For almost 26 years we have fought diligently to uphold that mission and so many of you have diligently supported us in that mission. For that, we thank you and are so excited that you will continue to support us and our mission through our next chapter. The Board of Directors are excited to announce the newest member of our team and our new Executive Director, Marie McQuillan. Marie comes to us with years of experience in the non-profit sector working specifically with the American Red Cross supporting the Service to the Armed Forces program: Marie was instrumental in building a team to expand Red Cross services for our military across the state of Alaska, to include the previously under-served remote areas of the state. Following that project, Marie served in Kuwait and Djibouti for nine months providing emergency communication services for military members and their families, made resiliency programs available to deployed troops, and ran a canteen facilities on the installations. Most recently she has been working locally as the Volunteer Services Manager of Southeastern Colorado, working to create partnerships and building capacity in our community. Marie has Bachelors of Arts degree in Sociology from Coe College in Cedar Rapids, Iowa. After moving to Alaska, she and her husband enthusiastically embraced the outdoor lifestyle and spent their free time hiking, camping and fishing with their dog, “Leo.” They fell in love with Colorado Springs almost immediately. The strong community bond, persistent sunshine, and peaceful mountains made this city feel like home. Like every community Marie and Ian have made their home, Marie strives to build lasting and meaningful impact that will reach all those in need. When asked what she would like to say to the many people who have supported and received support through our organization she said this: “Thank you so much for the opportunity to serve. I am truly honored and humbled to be a part of Pikes Peak Suicide Prevention and I will fight each day to uphold our mission. I know that we have made a huge difference in our community in the past and I look forward to growing our reach and providing resources and services to as many people as possible. 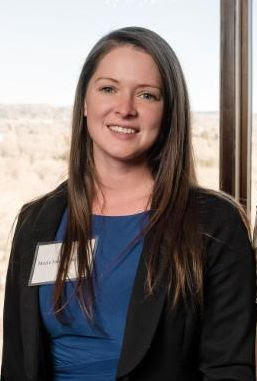 Please join the Board of Directors in welcoming Marie to Pikes Peak Suicide Prevention.